NASDAQ finally end the arduous wait since the release of the “AGM/Fourth Quarter Slump” EP in 2011 with “Collateral (Damaged)”. The Manchester instrumental trio mark their seventh year since emerging as the dark ugly Mr Hyde to the Dr Jekyll of financial funk band The FTSE 100 with their heaviest offering yet. Moving through passages of crushing doom, hypnotic melody and wrist-breakingly complex riff attacks, “Collateral (Damaged)” takes everything this prodigiously talented unit has done before and makes it bigger and better. Imagine a band that somehow manages to sound like Earthless, Owls, Don Caballero, Iron Maiden and Kyuss all in the space of one track and bring it all together to create a cohesive mind-altering, consciousness-expanding voyage to a higher plane. That band is NASDAQ and “Collateral (Damaged)” is another step in their journey to the outer realms of instrumental rock. The instrumental juggernaut that is Mothertrucker mark their 13th year of psychedelic riffcraft with 2 new tracks, half of a split with Manchester titans, NASDAQ . A combination of Sabbath/Kyuss style hard riffs and the quiet menace of Slint and Mogwai, these new compositions are a sweet hellride into the heart of oblivion. Thick distortion, menacing atmospherics, head nodding tempo changes and rewarding climaxes...there’s plenty to get lost in! Over the course of their existence, Mothertrucker have shared the stage with the likes of Boris, Baroness, Grails, Golden Void, OHHMS, Kruger and Thought Forms and look forward to spreading their heavy gospel to as many venues as possible in 2017. Limited to 300 LPs on black vinyl. Co-released with DG and Field Records. A meeting of instrumental minds, from Manchester and Birmingham respectively, both from the post rock seas that are within the distant glow cast by lighthouses set upon doom shores. 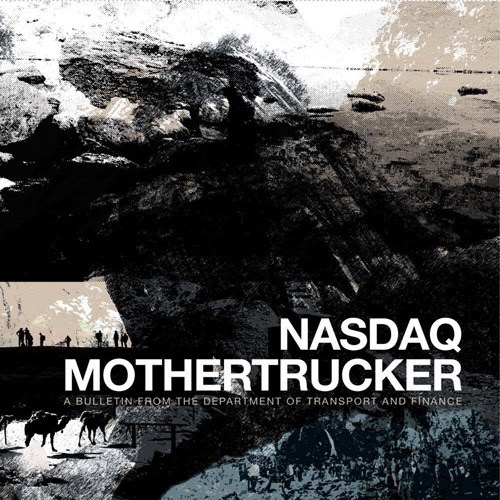 Nasdaq have been fairly dormant for a while now, and Mothertrucker have always flitted between bursts of activity and long periods of silence, this therefore acting not only as an especially welcome release but as a safety in numbers reemergence, like a joint venture out for a claustrophobia support group, better together. Nasdaq return Collataral (Damaged), a near quarter of an hour track. Meandering, light and shade, six minutes in it reminds me of Snowblood's more introspective moments with its deft touch of beauty and move into a heavier drive forward. The subtle traction is hard to spot, movements and evolution not tracked but only subconsciously realised, the track melting through your mind, so as to create a similar listening experience as the great heavy psych bands, without actually dipping the toe into the acid laced waters. For someone not overly enamoured with post rock, I find this relaxing to the point where I lose track of time and its ending comes as a surprise. I've probably said it before - I first reviewed them for ninehertz twelve years ago - but you have to admire Mothertrucker's unwavering belief in applying imagination-firing titles to instrumental songs. Here it's with Gateway to Khyber and Saved by the Belgian, greedily offering double Nasdaq's contribution. The first of those feels its way along, then, halfway through, a flicker, a warmth begins to spread, from which they build a platform where they can pour outwards, never overly heavy, but with a grand and impressive assurance. On to the latter. A bassy pulse, hypnotic guitar, this has me straight away, like only the best post-rock/metal can and should - breathless in anticipation as it constructs towards its release, so expertly engineered it is to that point. When that arrives it is arguably too heavy (yeah, I did just say too heavy, I'm shocked too) and too raw to truly befit what came before. Never mind, it moves on quickly, back into the swirling guitar, a fog of psychish creation, at times touching Earthless or even more straight up stoner rock vibes, a real hark back to Mothertrucker of old. It is a glorious indulgence to play out on. After which, all album considered, I'm left with a satisfied, fuzzy glow. A dual fantastic return to the fray, and hopefully the beginning of a new chapter for both. Well how's this for a monumental line-up for a split record? Manchester-based NASDAQ's EP 'AGM / Fourth Quarter Slump' blew me (and pretty much anyone else that listened to it) away when it got released a few years back, and Stourbridge-based MOTHERTRUCKER have been consistently putting out colossal stuff for as long as I can remember. So NASDAQ only have one track on here but it's about fifteen minutes worth of instrumental magic that drifts in and out of huge riffs, sweeping highs, technical funky beats, and ambient interludes. They're very very good at building momentum, playing a similar rhythm for a good few minutes at a time, but working in subtle intricacies on each instrument, giving you plenty of time to get into the groove of each section before it falls away into new territory. Nestled in amongst the longer parts of this tune, there's an absolutely killer riff at about 8:50 in, which is made all the more special for its short length, and is worth replaying the whole song back for. I'm always amazed at the dynamism and contrast in highs and lows that they manage to create with just one guitar. Awesome stuff. MOTHERTRUCKER are another great band for dynamics, but focussing a little more on the heavier side of things, with the kind of cathartic riffs that only a band that has been going for over ten years can forge. Both of their songs on this half of the split are dark, sludgey, post-metal affairs, that contrast the heavy textures of metallic riffing with delayed, stoner leads, which break into atmospheric, spacey interludes, before caving back into some more monumental riffs and sweeping melodies; a contrast that's emphasised by some careful and effective song structuring, and some really killer drumming that's all at once solid and pounding, and tight and technical. An atmospheric yet crushing listen. Definitely a split to pick up for fans of amazing prog / stoner / post-metal heaviness.